Esri Vector Basemaps have been available since 2016. 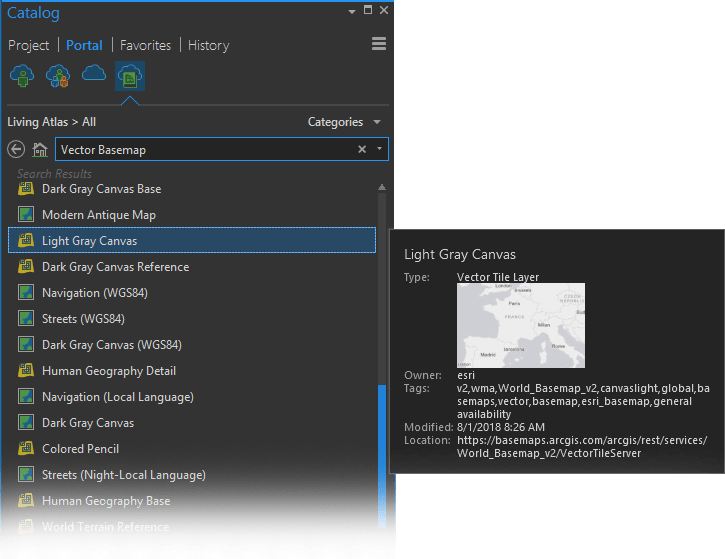 They offer a number of advantages over raster basemaps – notably their resolution (particularly on high definition monitors), and their update frequency. And because map styles are applied client-side, we can (and do) generate many more variations than we were able to before. The addition of the ArcGIS Vector Style Editor makes it easier for you to customize our styles as well (a little or a lot) to create your own versions. 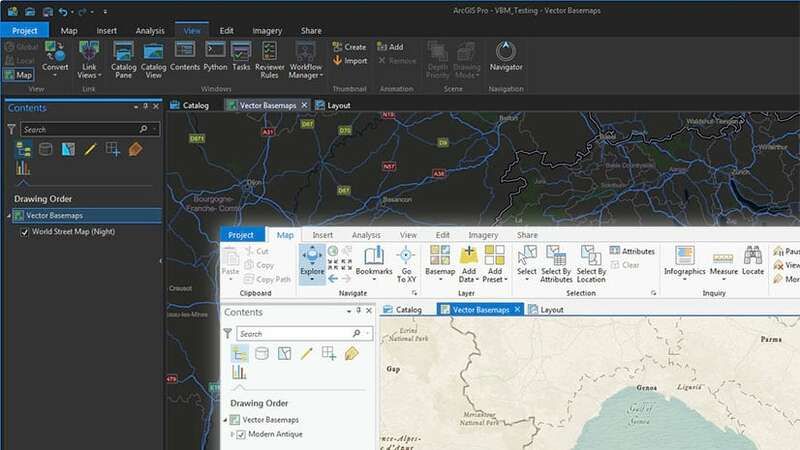 The maps are also available for use in ArcGIS Pro, and that opens up some other possibilities for you. In particular, they retain their vector detail and resolution, and they can be exported in raster or vector format. This is a look at the mechanics of working with them. 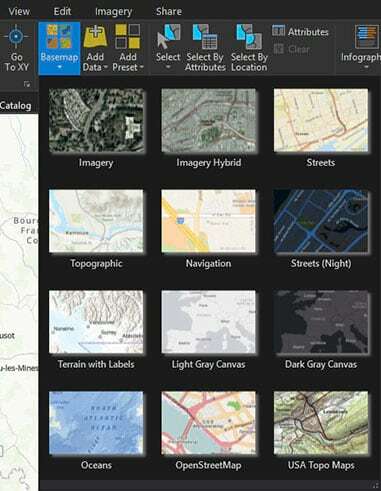 ArcGIS Pro has a drop-down menu (in the ‘Map’ tab) to access basemaps. The default set is raster, but your organization administrator can customize these settings, including changing them to vector if it suits. This is the drop-down basemap menu from our organization, with vector basemaps preferred over raster where they are available. If you are adding to an existing map, choose a layer. Check the float-over window to confirm that you are accessing Esri content. Generally, because the Living Atlas has curated content, your selection will be safe, but it’s always prudent to confirm that. A lot of users save their own copies of Esri basemaps, and many of them retain the same name. There are a number of options for sharing your map online. … will convert your custom information to a feature service, and maintain a link to the online basemap and other services so that your work remains intact. … gives you options for publishing your work as a feature service, cached tile service or vector tile service. Regardless of your choice, it will generate an error if basemaps or other services are included in your document. No need to worry however – Remove them from your Pro document. Once your layer is published you can open it into a web map, and add them again online. Note that, unlike ArcMap, an export from the map itself does not retain the display area. Rather it sets a square layout, usually 10 x 10”. To control the area of the export, you will need to create a layout (although within the layout export you do have an option to print the display area). For all of these tests I exported the map at 300 dpi with the ‘Best’ settings available. Where relevant, fonts were embedded. The exports were opened into Adobe Illustrator or Photoshop to test their characteristics. Unlike our traditional cached basemaps, which are fixed at 96 dpi, a vector basemap will export at the resolution you select. A 300 dpi resolution will give you a good result for local and desktop printing. If you are going to a commercial print you may have to set the resolution higher, particularly if you are using small labels. Patterned effects (built into the basemap as 192ppi PNG sprites) translate as raster tiles, masked by a vector polygon to give the area shape. The tiles themselves are not accessible. Sprite point symbols are built also as 192ppi PNG sprites, usually with a rectangular mask. Transparency is converted to ‘opacity’ (the reverse of ‘transparency’), but this does not change the look of the map. The opacity value can be changed, but it requires isolating the object from a complex grouping structure, and that can be tricky. Labels will be retained as font objects, and they will translate as individual characters rather than text strings. However, this is only true if you have the relevant font loaded on your computer. If you don’t have the font, the characters will be rasterized as individual objects (at the defined resolution). This is an enlargement of a small area from an export of the Modern Antique basemap. The font (Alegreya) for ‘Vierwaldstättersee’ is loaded on my computer. The others are not. Most of the fonts we use are open source, so if this is an issue you will be able to download your own copy of the font (Notable exceptions include the Human Geography maps, which use the licensed font ‘Avenir Next’). To check on what fonts are used, you will need to access the JSON style file or use the ArcGIS Vector Style Editor. Regardless, it is worth setting a high resolution for the pdf export, just in case any fonts are missing. SVG: Vector format is retained, but the draw order is affected and, and although most objects are there, they may not be visible or editable. In my experiments, labels translated as polygons, but were not visible. EMF and EPS: Both seem to be sensitive to something within our basemap structure. In my experiments, the whole image rasterized at the chosen resolution. To some degree the pdf-exported map is editable in programs such as Adobe Illustrator, but be cautious. Selecting an object can be tricky (the ’Select same fill and stroke’ option in Illustrator is invaluable for this). Trying to re-layer the information can have unforeseen consequences, and is not recommended unless you are prepared to spend a lot of time working it out. And of course you’ll need to work around the issues with fonts, sprites and transparency discussed above. So now you have the option of supporting a map export with a high-resolution basemap. This should improve the results for you if you are planning to use it in a simple map for hosting online, and it is particularly useful if you want to use a basemap as a background in a high quality or commercially printed map.